JERUSALEM - Israel's prime minister on Tuesday abruptly halted a plan to explore the potential construction of thousands of new homes in West Bank settlements, saying it had created an "unnecessary confrontation" with the international community that threatened to weaken his campaign against Iran's suspect nuclear program. The plan announced by Israel's Housing Ministry earlier in the day had prompted a Palestinian threat to walk out of U.S.-brokered peace talks and drew angry criticism from officials in Washington, who said they had been blindsided by the move. "This step does not contribute to settlement. On the contrary, there is damage here for settlement," Netanyahu said. "This is a meaningless step -- legally and in practice -- and an action that creates an unnecessary confrontation with the international community at a time when we are making an effort to persuade elements in the international community to reach a better deal with Iran." The statement said Ariel had accepted the request. The issue of settlement construction has been at the heart of a standstill in peace efforts in recent years. The Palestinians claim the West Bank, east Jerusalem and the Gaza Strip, territories captured by Israel in 1967, for an independent state. They say Israeli settlement construction on occupied lands is a sign of bad faith. More than 500,000 Israelis now live in the West Bank and east Jerusalem. Israel withdrew from Gaza in 2005. The ministry refused to say how many of these homes were in settlements. But the anti-settlement watchdog group Peace Now, which closely monitors construction activity, said the plans included nearly 20,000 apartments in the West Bank and 4,000 in east Jerusalem. In all, Peace Now says Netanyahu's government has given final approval for nearly 3,500 new homes in Jewish settlements since taking office last March. In addition, it has promoted plans for nearly 9,000 additional homes. The international community rejects settlements as illegal or illegitimate, and the reaction to Israel's plan was swift. The chief Palestinian negotiator, Saeb Erekat, said that at the instruction of his president, he had contacted the U.S., Russia, the European Union, the United Nations and the Arab League to voice objections. "I informed them that if Israel implements this decision, then this means the end of the negotiations and the end of the peace process," Erekat said. In Washington, State Department spokeswoman Jen Psaki said the White House had been caught off guard and demanded "further explanation" from Israel. "Our position on settlements is quite clear -- we do not accept the legitimacy of continued settlement activity. We've called on both sides to take steps to create a positive atmosphere for the negotiations," she added. Peace talks resumed in late July after a nearly five-year break. The sides have set an April target date for reaching an agreement. Under heavy U.S. pressure, the Palestinians dropped a longstanding demand for a halt in settlement construction. To lure the Palestinians back to the table, Israel agreed to release 104 of the longest-serving Palestinian prisoners, all convicted in violent attacks on Israelis, in four phases. The Palestinians also say they received assurances that settlement construction would be constrained. Both sides have said the negotiations have made no progress. The situation deteriorated further two weeks ago when Israel, responding to its release of a second batch of prisoners, announced plans to build thousands of new homes in the West Bank and east Jerusalem. Those plans remain on track. In an interview broadcast on Israeli and Palestinian TV last week, U.S. Secretary of State John Kerry said continued settlement construction raised questions about Israel's seriousness about pursuing peace. Erekat, the Palestinian negotiator, said there have been no negotiations for the past week. 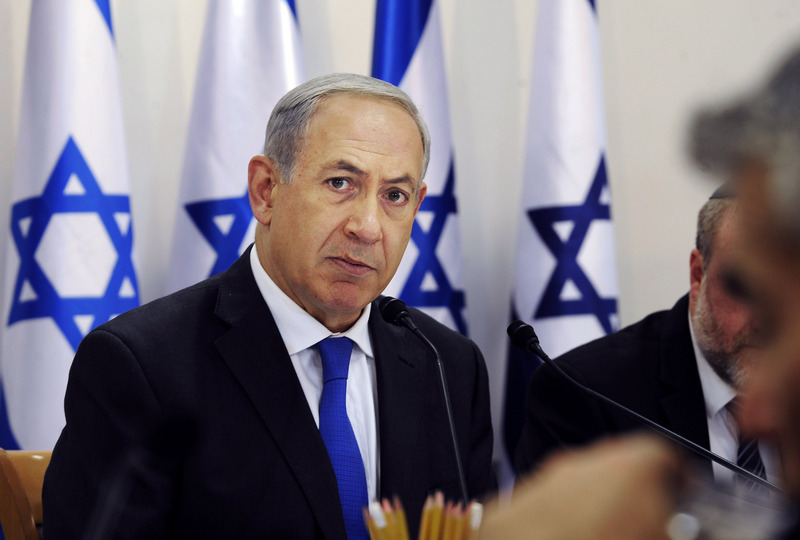 Israeli officials had unsuccessfully tried to play down Tuesday's announcement. They said the government was merely beginning a long-term feasibility study and no new construction had been approved. Any construction that does take place, they added, would be years away. The Housing Ministry said it had published bids seeking architectural firms to look into possible construction of some 600,000 homes nationwide to ease a chronic housing crunch.
} In recent days, Netanyahu has feuded with the U.S., his closest and most important ally, over the troubled Mideast peace efforts and attempts by the international community to curb Iran's nuclear program. Netanyahu has harshly criticized U.S.-led attempts to reach a compromise with Iran that would curb the Iranian nuclear program in exchange for relief from painful economic sanctions. Netanyahu, who fears Iran is developing a nuclear weapons, says pressure should be increased, not eased, until Tehran dismantles its nuclear program. U.S. officials have said Netanyahu's criticism was premature, since a deal with Iran hasn't been reached.